Explanation: Seen from the Canary Island of Fuerteventura, this bright Full Moon rose at sunset. Reaching its full phase on the night of January 4/5, it was the first Full Moon of the new year and the first to follow December's solstice. Of course, in North America the first Full Moon of January has been known as the Wolf's Moon. But this Full Moon, posed in the twilight above an island of strong winds and traditional windmills, suggests another name. 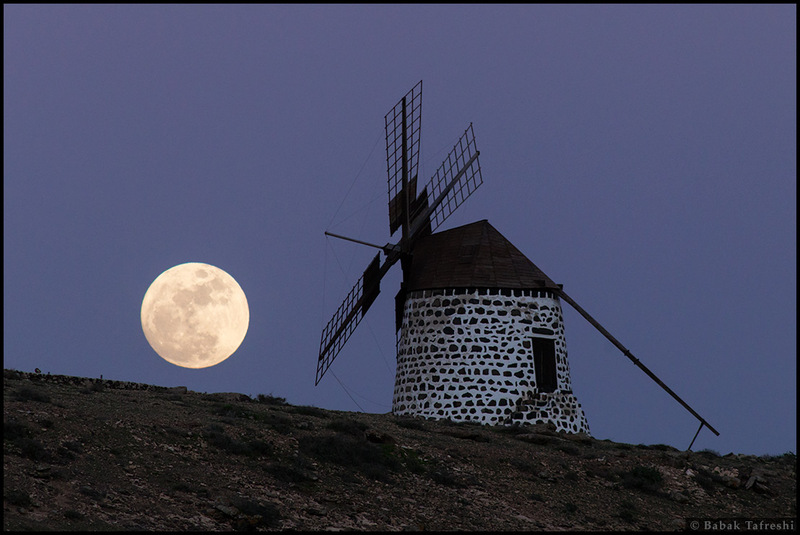 The telephoto image, taken at a distance from the foreground windmill, creates the dramatic comparison in apparent size for windmill and Full Moon.